Digital design asset marketplace Envato has announced the launch of Envato Elements, the first unlimited download, community-generated design subscription for marketers, agencies, designers and other creative professionals. A new platform from design asset marketplace Envato is offering graphics, templates, add-ons and fonts under broad usage rights for a monthly fee. 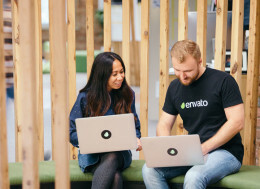 Envato Elements, as the new product is called, claims to be the only design subscription service using a progressive subscriber share model, and aims to “transform how the digital community both buys and sells designs online by providing fair compensation for its content creators”. Content for Envato Elements is provided by a global community of independent designers, and gives subscribers access to a fresh and diverse library. The service was created to better serve frequent users of digital assets who care about design. The platform curates and showcases a unique library of content with a strong focus on quality and on-trend items. A single, commercial use license applies to all items on the site. Unlike many other subscription services – such as those in the music industry – subscribers’ money actually goes to the contributors that they use and value. This encourages contributors to create items that are broadly appealing, as well as those that serve various niches. This article first appeared on Marketing. Folio is ready and waiting for your submissions!